Learning about President Dwight Eisenhower? 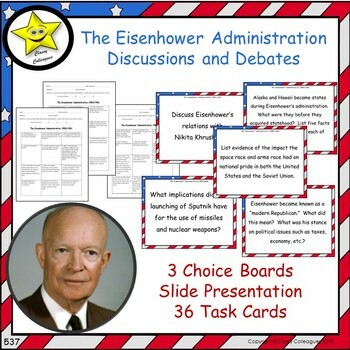 These choice boards, slide presentations, and task cards provide 36 thoughtful and purposeful discussion questions/writing prompts related to the Eisenhower Administration. · stimulate thought and spark more questions. · provide the springboard for intense discussions. · are broad in scope and promote inquiry in the minds of your students. · require student to support their ideas and justify their answers. 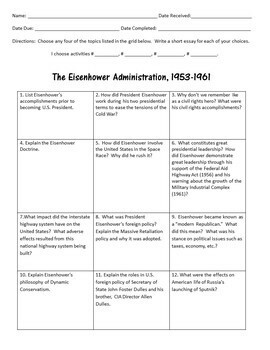 Three Eisenhower Administration Choice Boards, each with twelve discussion questions/essay topics. 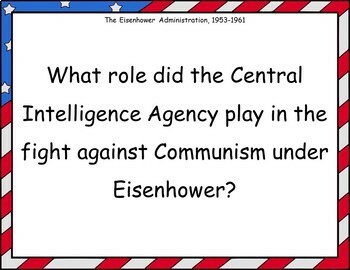 An Eisenhower Administration Slideshow of the 36 questions, easily projected for whole class discussions or writing activity. 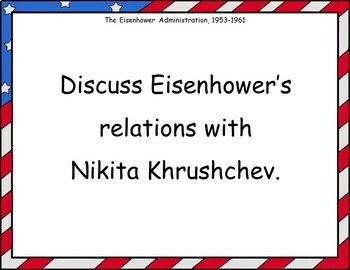 Thirty-six Eisenhower Administration task cards, each with one question, suitable for individual/small group work, learning stations, interactive notebooks, and more! The choice boards allow students to choose how they will learn the concepts. Students can choose which activities to complete. These are great for individuals and team projects as well as extra research for accelerated learners. The slides can be projected onto a whiteboard or Smartboard and used to promote discussion or writing while deepening the thought processes of the students. Some teachers use these as Essential Questions to spark class discussions. Others print the slides to post in the classroom as reminders for students and to trigger their high level thinking abilities. Teachers enjoy using the task cards in a variety of ways, such as enrichment centers, and to post on bulletin boards. Another option is to have students work together on a task card question while you are working with a group. Distributing cards to individuals or groups to use as an essay topic is still another way teachers use these. Since the questions are challenging, these cards are great for fast finishers.